Summer is a time for salads and instead of sticking with the same old, same old I do try to change things up from time to time. This salad has a delicate flavor – nothing is shouting – it all blends together well and if you have it at room temp it really brings out the nuttiness of the grains. To tell you the truth you don’t even need the berries, but they do add a nice touch. Sorry I can’t say where I got the recipe – some clipping I’ve had for years and never wrote down the source. Just one note though – plan ahead because the barley and wild rice do take 45-55 minutes to cook and then they have to cool. *optional to toast grains in a 350′ oven before cooking! That is one great salad. Has everything I love in it! I’m trying to think of wild rice salad as well. to try it tonight. Maybe I’ll substitute blue berries! Oops! No leeks. We better go shopping. I’m set on this salad for supper! It looks so good! At first I was a bit thrown off by the idea of a rice salad with berries but when I looked at the recipe, I loved it! It just screams “summer” all over! I would probably add a bit of honey to sweeten it up too. Oh YUM!! I want this for dinner tonight.. or lunch.. I’ll even eat it for dessert!! This looks fantastic! 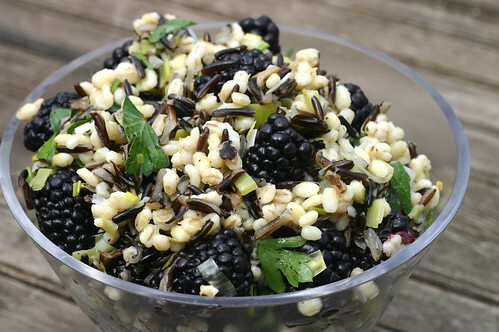 I love wild rice, and this combination sounds great. My job is to cook for crew on a yacht and I have been seeking out some new easy, healthy and delicious recipes an I just love this site!!! Everything I am looking for! Thanks for all these wonderful creations.